I meant to write today, but an Osprey outside my window kept calling me to play. It circled round and round above the pines outside my second story window. “Come out! I’m flying!” I checked my timer (more on that later). Fifteen minutes of writing to go. I’m on a creative roll . . . Can’t stop now. Sorry. I paused. Several years ago, I saw an Osprey through my bird scope when it first ascended from its nest. Perched on the outer edge of its spindly woven branches, it flap, flap, rested. Over and over. Flap, flap, rest; flap, flap, rest; until one set of flaps lifted it straight up from the nest. Oh my. Back down to rest, then flap, flap again. More height. Each lift-off took it higher, until the wind beneath its wings gently drew it forward and away from the nest. At first it glided motionless, then instinctual pull of muscles set the wings in motion. I knew I was witnessing the first-steps-of-a-toddler moment. I looked down at the timer on my desk, then at my laptop. “Oh hell. I hit “save” and flew downstairs in time to watch the white streaked underbelly fly low overhead. I followed the squeals as it circled the house then flew west, its calls fading into the distance. I stood, bare feet on a wet lawn, binoculars dangling from my hand, and laughed. Back at my desk, mind now up in the trees, I reset my timer and try to refocus. Distractions: How does the Pomodoro Technique address them? My writing friend, Heather Donahue, introduced me to this time-management system that’s immensely helpful for staying focused and productive in writing. Set a round, tomato-shaped ticking timer for 25 minutes. ( Pomodoro = Tomato in Italian). Write until it dings. Set for 5 minutes and take a break. Return for 25 minutes of work, 5 minutes off. Flap, flap, rest. Flap, flap, rest. 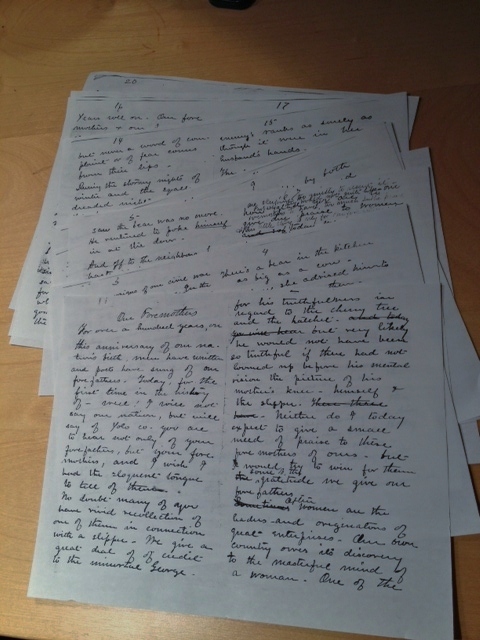 I get a lot done that way – writing, cello practice, long projects, etc. Being focused is good, but I realize I live in a world surrounded by mystery. If I don’t allow myself to be distracted by nature, I miss out on the sheer joys of life. I can always reset the timer later! ** Thanks to my neighbor, Rod Bondurant of Camptonville, for permission to use his beautiful photo of the Moonshine Ospreys. While Ospreys aren’t an unusual bird near bodies of water, the Moonshine Road nest is in the Tahoe National Forest, half-way between Bullards Bar Reservoir and Middle Fork of the Yuba River. 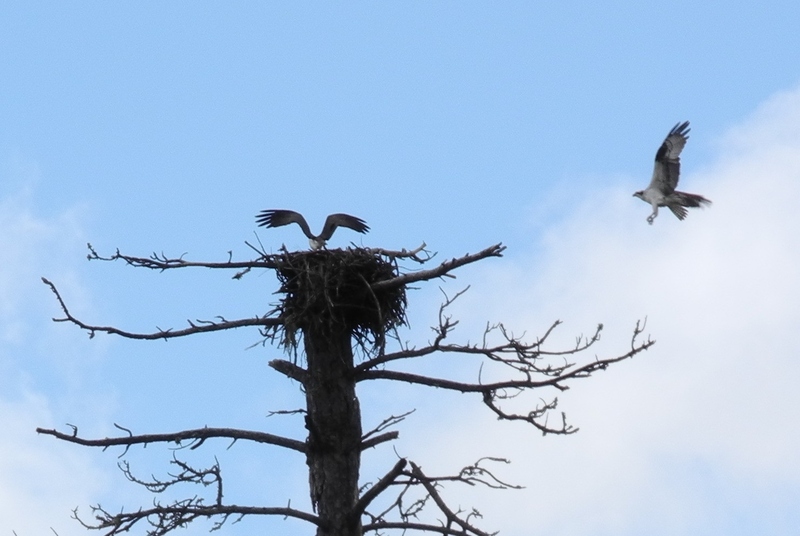 Neighbors have been watching this Osprey family return since 2006.